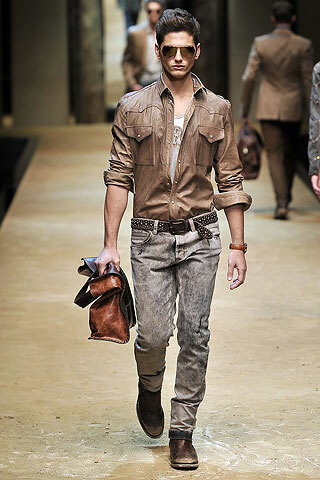 Gimme some Dolce and a whole lotta Gabbana!!! omg. I am back. Miss me much ? As men after my own heart, they start their own trends while staying true to their overall purpose and vision of their line. And to top it off they received a hilarious product placement in the new movie Bruno so I absolutely had to dedicate a blog post to them. As the tycoons of 2 successful lines, Dolce&Gabbana and D&G, Domenico Dolce and Stefano Gabbana are Italian born sweethearts. With clients that are among some of the best dressed people in the world,these two men are heavily influential, but they weren’t born this way. Let’s take a look at their journey to the top. Starting with Domencio Dolce (above) who was born on September 13, 1958 in Polizzi Generosa near Palermo, Sicily. He remained in Sicily to studied fashion design and gained experience through his parent’s clothing business which focused on clothes for everyday wear, a far shot from his line today. His father’s profession as a tailor was a huge inspiration for him to get into fashion. He uses design as a way to capture and bring to life the things he dreams about and to translate the dreams of others into wearable art. 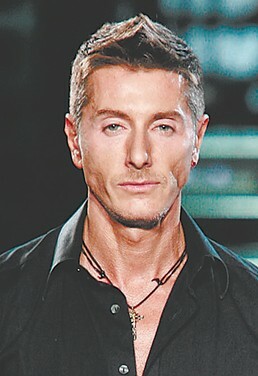 Stefano Gabbana (above) was born in Venice, Italy on November 14, 1962. He, on the other hand, studied graphic design at a University in Milan. He became interested in designers when he was young, in particular Fiorucci. However he went to a University because he also desired to go into advertising. Upon graduating he dabbled in advertising and quit after he found his heart wasn’t in it. It was then that he came to learn the art of fashion during a hands-on experience as an assistant with an atelier in Milan. It was at this atelier in Milan in 1980 where the D&G duo met. Both interested in fashion and in each other , they inevitably hit it off. Stefano and Domenico did freelancing work to sharpen their skills for the adventure they would embark on six yeas later, their own line. 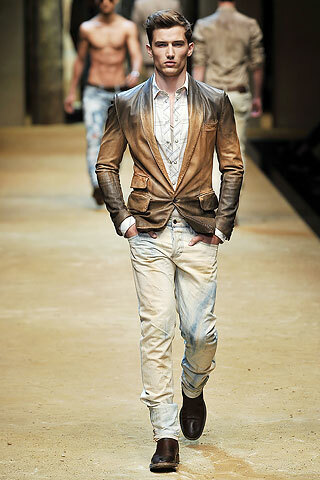 Stefano claims that though he learned a lot from the atelier in Milan, he learned the most from Domencio about fashion. They decided early on that women would be their target market to get them out of the land of freelance and in their own fashion house. They formed an informal partnership in 1982 by freelancing for other companies. They were then able to break out and indeed they tried to make a name for themselves, but they were not getting noticed. They recall their first show in a tiny apartment, using friends as models and without the help of any professional PR people. They even held shows in fast-food joints, the invitations were shaped like hamburgers. Their quirky antics received some attention and got them a spot in 1984 Milan fashion week, in the New Talent Fashion show in 1985. People fell in love. 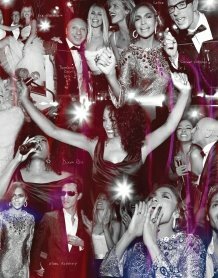 In 1986 they launched their very first women’s line, Dolce&Gabbana, further solidifying their union. Soon after they opened their premiere boutique in Japan. Their style his a bit of history behind it, which makes it so unique. They believe that men’s and women’s clothing should have a touch of the opposite gender in them. Their reasoning was that in the 16th century men wore make up and heals and women were wearing manly suits and flat shoes. They use this theory to make their clothing, moving away from modern trends where clothes enforce gender distinctions. Additionally, they attribute the style of their line to their differing tastes. 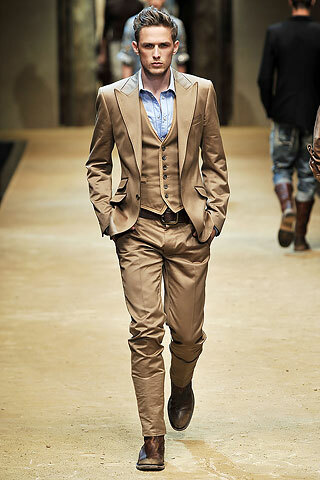 Dolce and Gabbana have such different tastes that they are able to cover a lot of bases in the market. Together, they both love style and feel of southern Italy and that is seen in their designs. Though Dolce and Gabbana gained popularity on their own, they received a great deal of attention after designing 1,500 costumes for Madonna’s World Tour in 1993, The Girlie Show. They even designed a backdrop for the entire tour. In 1995 they published a book called 10 years of Dolce and Gabbana which paid homage to their first decade of fashions, which an intro done by Italian actress Isabella Rossellini. Her endorsement made their popularity spread rapidly, requiring all the celebs had to get their hands on a Dolce and Gabbana piece. Following their success, they published their second book in 2003 called Hollywood. In 1997 they reported making 400 million Euros which is about 800 million dollars. They tried to tell everyone they would retire, but that was promise they did not keep, THANK GOD. Ok so evidently the two were romantically involved since about 1985, but they publicly announced it in 2000 right before buying the Villa Volpe in 19th century palazzo in the center of Milan to live together. However in 2005 they split and moved into separate apartments. They reassured everyone that their label would not be effected and rest assured, it definitely was not. Their professional connection proved to be made of a non-rusting metal thread. It was also in 2005 that they reported making 597 million pounds, just about 1 billion dollars. Today Dolce is in a relationship and Gabbana is single. They both live in the same building but on different floors. The drama continues on July 9th their public relations director Ali Wise was arrested on felony computer hacking charges. She was held in cell with no A-list treatment for one night. According to Page Six she was caught using a “computer to unlawfully engage in wiretapping, for eavesdropping, and for computer trespassing to commit felony,” in laymens terms that probably means she was trying to get into someone’s email to be nosey. Shame on you Ali for bringing any type of negative attention to Dolce and Gabbana. The Woolmark Award for the most innovative Men’s collection in the year 1991. In 1996 it won “Oscar des Parfums” Award which was the first time a Frnch Award was given to an Italian fragrancefor its “Dolce & Gabbana Pour Homme”. In 1996 and 1997, they were the recipients of the “Designer of the Year” award voted by the readers of the British magazine FHM. 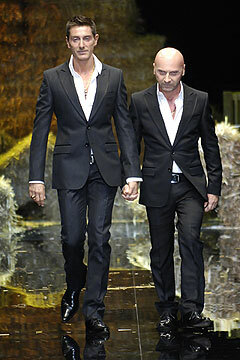 In 1997, Dolce & Gabbana was awarded the footwear designer of the year by the American magazine “Footwear News”. In 1999 they were the recipients of the “Style Award” assigned by Russian Harper’s Bazaar. In 2001 they received the “T de Telva” award for best international designers; assigned by the Spanish magazine Telva. In 2004 they were voted as the “Best International Designers” by the readers of British Elle vote for Elle Style Awards. In 2004 they were recipients of the German ‘Leadaward 2004’, the most important advertising prize in German speaking countries, assigned for the Fall/Winter 2003/04 advertising campaign. In the same year they received first prize as the best website in eyewear category at Annual Interactive Key award in Milan. In 2004, at the Università Bocconi in Milan, Dolce & Gabbana received the “Premio Risultati 2004” award for the company’s financial performance and best financial statements during the four-year period of 1999-2002, and for its strategic positioning and development prospects. In 2005, Domenico Dolce and Stefano Gabbana are presented the ‘GQ Men of the Year Award’ for best international designers by Russian GQ. In 2006, Dolce & Gabbana were presented in Hamburg the Leadaward 2006, considered one of the most prestigious German awards for the Best Advertising Campaign of the Year (“Swinging London,” women’s campaign Fall / Winter 2005/06). 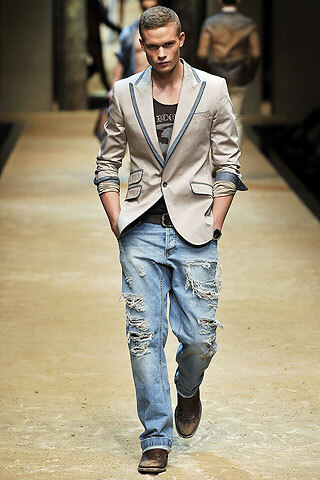 A little taste of the Spring 2010 men’s line !